Coworking spaces, collaboration is the new trend! Coworking spaces can be seen as a perfect mix of the best of working in an office/“corporate job” and the best of being an entrepreneur. In one hand you get to have a community to support you and a place to work, and on the other hand you have the opportunity to work in what you are really passionate about. This movement started in 2005 in San Francisco and apparently a lot of startups, SMEs, freelancers and remote workers shared the same feeling/necessity because nowadays this community has quadruple in the last four years, in 2015 over 1 billion was invested in this industry, and nowadays there are more than 10,000 spaces around the world. 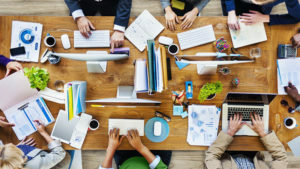 Coworking spaces are not only Wi-Fi, laptops and people working in independent things, this spaces have the purpose to gather and connect people that have similar interests and create a network of global collaboration. There is a Coworking Manifesto that had been signed by members of more than 2,300 working spaces. In this document there is a global code of conduct and values that “must” be follow. As an overall concept coworking is quite related to sustainability, both of them have a global vision of the 3Ps (people, planet, profit). This movement gives power to individuals and small business by connecting them and giving them a new vision of what collaboration means. Coworking is adding value to small enterprises by gathering talented people and helping them to expand their personal and professional network. One of the many benefits is that people that works in this spaces is more productive and motivated than when they were working by themselves or in other places. According to GCUC (Global Coworking Unconference Conference) people in coworking spaces is 84% are more engaged & motivated, 80% turn to other members for help o guidance and 89% is happier. Besides the space design plays a key role. The spaces should be flexible (for groups or individuals), should inspire collaboration, have recreational places where people can interact, private rooms and areas to have meetings. Essentially it needs to be a place where people get inspired, always giving the option to adapt to the way people work. I believe coworking spaces are changing the way we work, people is realizing that if we work under the right conditions we increase our productivity and we are happier. These new spaces help startups and SMEs feel part of something bigger, a place where they can find support, funds, workshops, and networking = collaboration. Wellcome to the International Master on Sustainable Development EOI collective blog.